When I was researching Negative Zero online, I found a few bands with this name, which isn’t so promising when you’re trying to find out everything you can about a specific group. This particular Negative Zero — based out of Oklahoma — show a lot of promise, but rely heavily on the bands of yesteryear like Rufio and latter-era MxPx. The album starts off well enough with “Let’s Bust Outta This Joint,” but from there, the songs become a little indistinguishable before picking up again midway with the powerpop jam, “Wondergirl”. There’s also an ill-placed ballad, “In the Shadows,” that should be shuffled towards the end of the record, if only for consistency. All in all, it’s not a terrible record, but it’s not necessarily a burner, either. The music are written well enough and comparable to that of any other band that is heavily influenced by ’90s Tooth And Nail bands, but the fact that many of songs are based on relationships with girls and the Lord make the album edge on the redundant side. 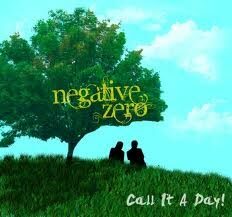 There are some solid tracks and Negative Zero can do well in the future, but Call It A Day definitely would’ve made a much better EP than a full-length.